On Monday evening (19/6), I took three battery-run actinics to a raised bog site near Pont Abraham, a heavily-damaged peat bog which formed in a topographical depression on the eastern side of a hill. Both the bog and the hill in medieval times formed part of an area put aside for the chase - a hunting `forest` - hence the name `Fforest` given to an adjoining landholding and the nearby village. Remember that `forest` in this context may, or may not, have been wooded. 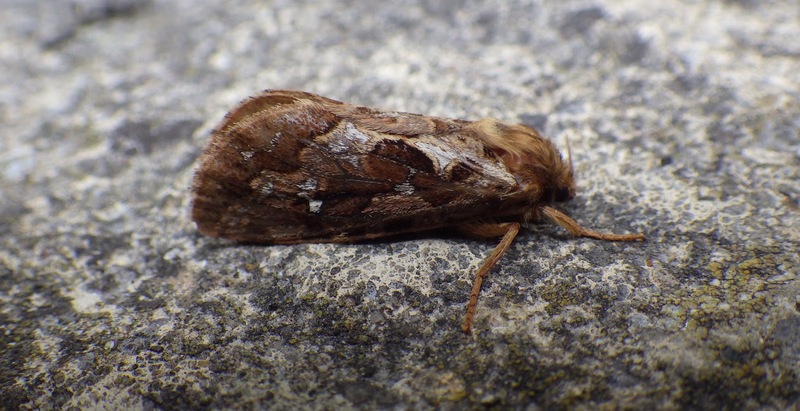 Enough of landscape history - now the moths. 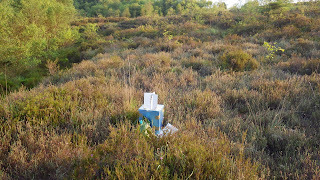 I had originally intended to place two of the traps on the bog but it was such a palaver carrying the trap, battery and other gear though tangled willow/bramble scrub, across ditches and boggy hollows that only one was placed on the bog. The oppressive heat did n`t help either, making exertion really exhausting! 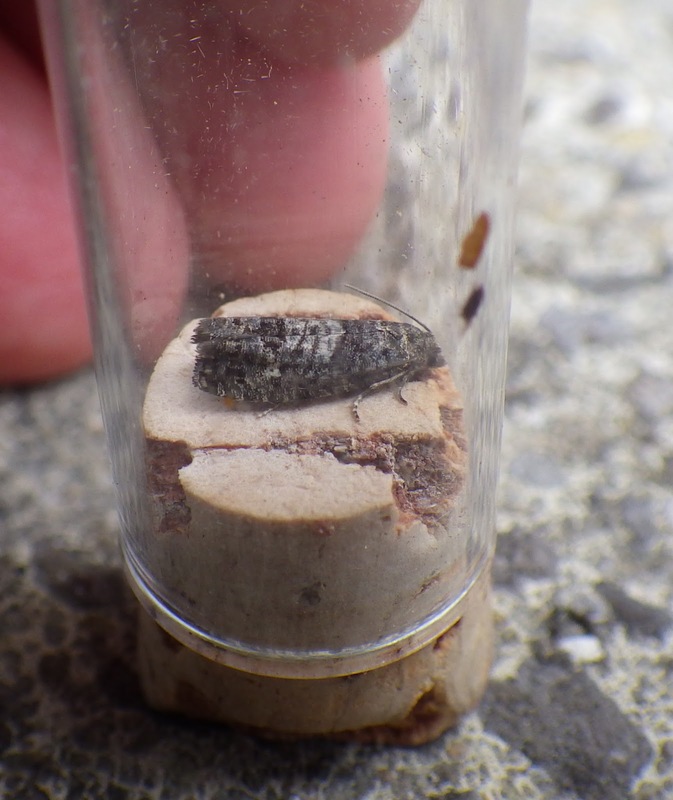 The second trap was situated in an easy-to-access nearby clearing within planted woodland of various conifers, with larch predominating in the section overlooking the trap. 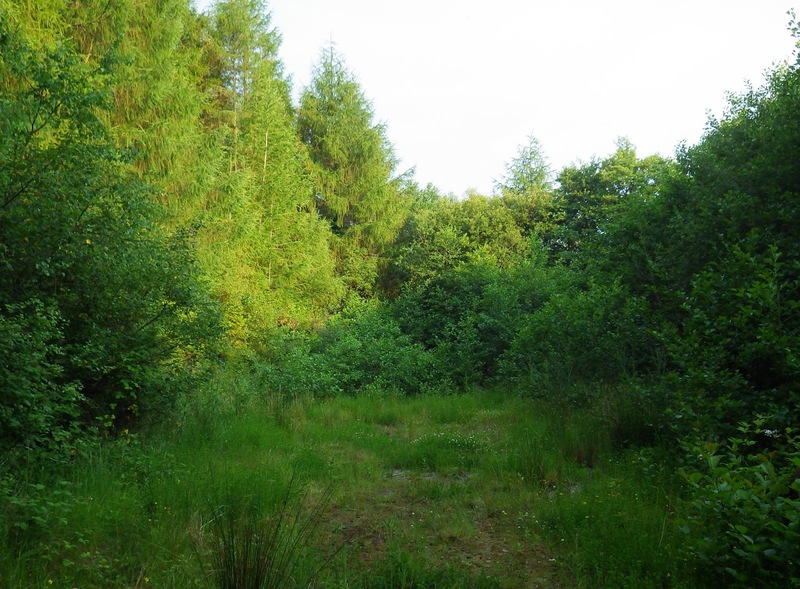 The third trap was put at its intended site - a pathside oak/birch/sweet chestnut woodland with an understory of bilberry. Above: the bog trap as left out for the night. 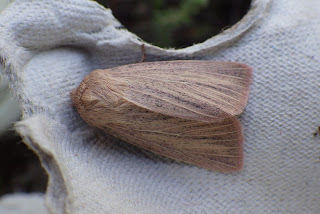 Above: striped wainscot. The pink suffusion to the hind part of the wings that George mentioned recently can be clearly seen in this photo. 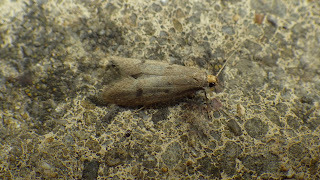 Above: Tinea trinotella, an inhabitant (as larvae) of birds` nests. The `larch clearing` also had 44 species , though a different mix to that on the bog. 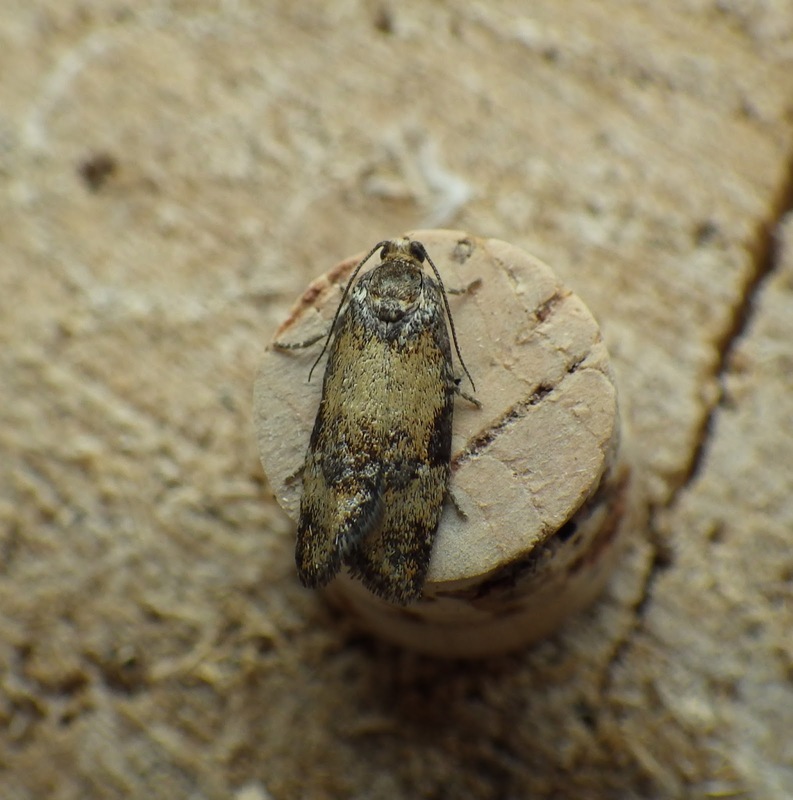 Barred yellow, beautiful snout, northern spinach, green silver-lines were among the macros, but the micros provided the more interesting moths. 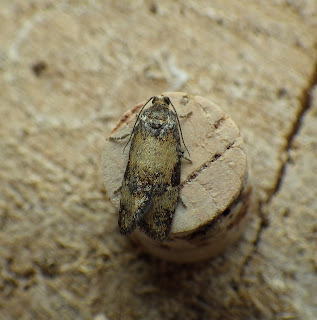 Among the latter were a nice haul of the attractive Ptycholomoides aeriferana (10) and half-a-dozen of what may be Spilonota laricina which, if confirmed, will be a NCR for Carmarthenshire. Both are associated with larch. Above: Ptycholomoides aeriferana, a lovely tortricid, with its metallic golden sheen. Above: What I think may possibly be Spilonota laricina (see p.49 of `Conifer Moths of the British Isles`). Above: I`m unsure about this one (I have some candidates) - any suggestions please? Also from the `larch clearing` (note that there are other conifer spp. growing beyond the larches). 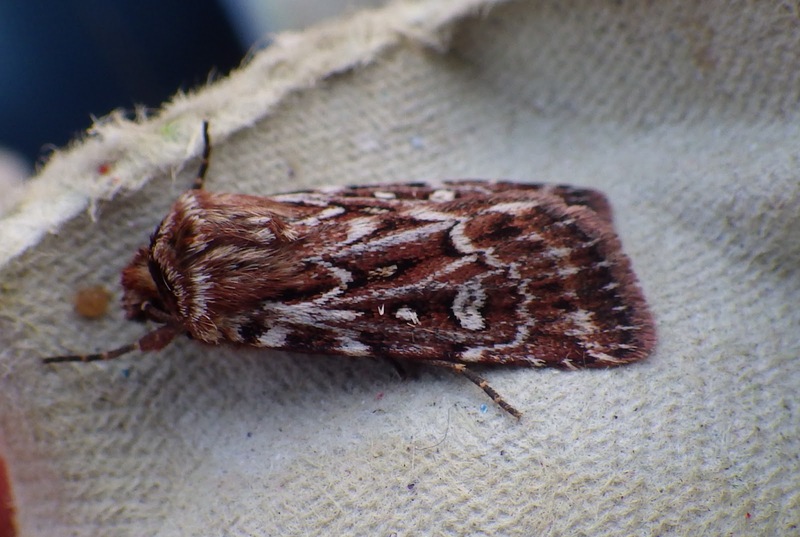 The third and last trap had 43 species (again a few awaiting i/d) and here many northern spinach, a scalloped hook-tip, and beautiful snouts were macro highlights, with Nematopogon sp, Eudonia delunella, Zeiraphera ratzburgiana and a solitary putative Spilonota laricina (this site is only about 30m away from the `larch site`. A light green-coloured pug was, on inspection, just a green pug rather than a bilberry pug which Sam has had at the very same site during a past daytime visit. Above: Nematopogon sp. 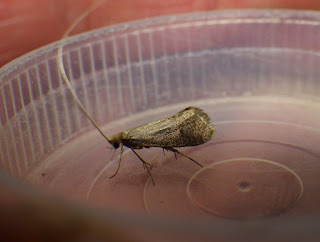 - metaxella due the length of the antennae? Above: an extra photo, showing a side view. It does seem to have a slight dark spot in the middle of the wing, suggesting metaxella? All in all, a worthwhile night and boosting records from the underworked SN50. The results were aided by the hot overnight temperatures. A sterling effort considering the heat! I'm envious of the Ptycholomoides - not seen that one, looks a stunner. 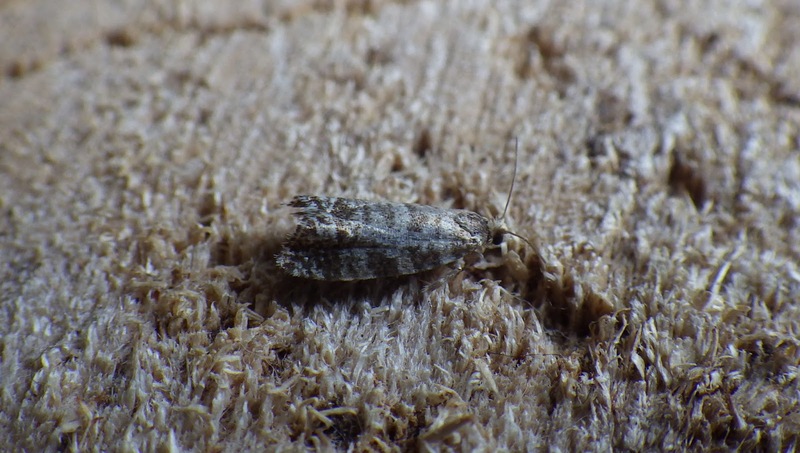 The first tortrix isn't Spilonota - note the white head. This is another conifer moth, Epinotia tedella. I think the second tort might actually be Spilonota but it would need dissecting to separate laricana it from ocellana. For Nematopogon, you really need a side view to see the wing shape and presence/absence of dark spots. I'm not sure how reliable the antennal length is. Thanks George for the correction. 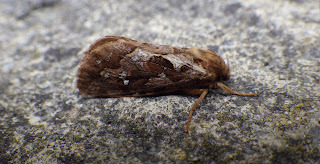 I`d seen E. tedella the other day too, when Chris caught it at Troserch and I thought initially - in the field - that mine was that, but once home thought/convinced myself that it was Spilonota! I`ve still got all three specimens so will retain them but will also get a side view photo of the Nep. in the meantime. Yes that's metaxella, dark spot and relatively blunt wing tips.